Anthony & Barry were once again in the mix in VdeV UK as the series made an overseas visit to the Assen TT circuit in Holland. Although they only qualified 5th, Anthony took the start and held a strong 4th position in the opening laps and took 3rd from Ally McKever as a light rain shower hit the track. Shortly after the rain started to fall heavier and Anthony and the team took a gamble staying out on slick tyres in the expectation the shower would be shortlived. 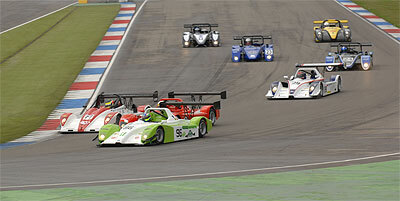 Anthony took the lead as the others pitted and kept the car on the track in very difficult conditions. However, their strategy backfired as the rain continued, leaving them falling backwards through the field. After 1 hour 30 mins of the 3 hour race, the track started to dry sufficiently enough for the slick tyres to gain some temperature & Anthony fought back through those who had passed him moments before, lapping 4 seconds a lap faster than the rest of the wet shod runners. He handed the car to Barry in 8th place after the mandatory 1 hour 45 minute limit that a driver can be in car. 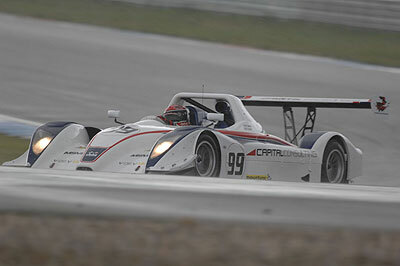 Barry drove a fine opening stint, lapping at a good pace but after a short while the rain started falling again! This time Barry came into the pits, changing for wets. In an attempt to make back the lost time he pushed too hard & had a few 'moments' into the gravel and fell back to 10th. The team decided to call it a day after a final call to the gravel trap, concerned of damage to the engine and the pair were classified 11th at the end. "Not the best of races all round" summarised Anthony "but we'll learn from it as a team and come back stronger for the next one". They next race at Croft, Anthony's "home" circuit and the scene of the pair's first race in 2006.